Centipede grass is a versatile, low maintenance grass variety perfect for varied applications across the southern U.S.
Best adapted to sandy, acid soils where annual rainfall is in excess of 40 inches, centipede grass tolerates very low soil fertility levels and thrives on moderately fertile soils. Centipede grass is moderately shade tolerant, but grows best in full sunlight. It is not as salt tolerant or drought tolerant as St. Augustine or bermuda grass. Centipede grass thrives on moderately acid soils, pH 5 to 6. 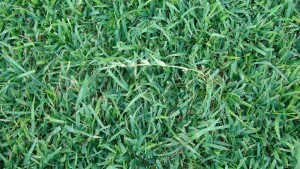 Centipede grass is used primarily for lawns, parks, golf course roughs and utility turf. Like St. Augustine grass, centipede grass does not tolerate heavy traffic and is not suited for athletic fields. Centipede grass is ideally suited for roadside rights-of-way and other low maintenance turf areas, but it can become a nuisance in adjoining pasture and crop land. Centipede grass can be easily established from sod grown at River View Farm in Alabama. See our Ordering & Delivery page for shipping details directly to your site across the southeast U.S.
Centipede grass has been described as a “lazy man’s grass” because of its low maintenance requirements. In general, annual fertilization, regular mowing and irrigation as needed to prevent severe wilting will meet with the requirements for a satisfactory centipede grass lawn. Too often homeowners try to push centipede with nitrogen to enhance color and growth. Excessive nitrogen fertilization may enhance color and stimulate growth, but it also leads to problems with centipede grass lawns. Annual applications of nitrogen in the spring and fall at a rate of 1 pound per 1,000 sq. ft. are recommended. A summer application of nitrogen at ° to 1 pound per 1,000 sq. ft. is optional. Water should be applied when centipede grass shows signs of water stress: wilted and discolored turf. Light, frequent applications of water should be avoided since it promotes shallow rooting. Thoroughly wetting the soil 4 to 6 inches deep only when the grass shows signs of moisture stress is the proper procedure for watering centipede grass lawns. Sandy soils require more frequent applications of water, but the soil should be wet 6 to 8 inches deep after each irrigation.